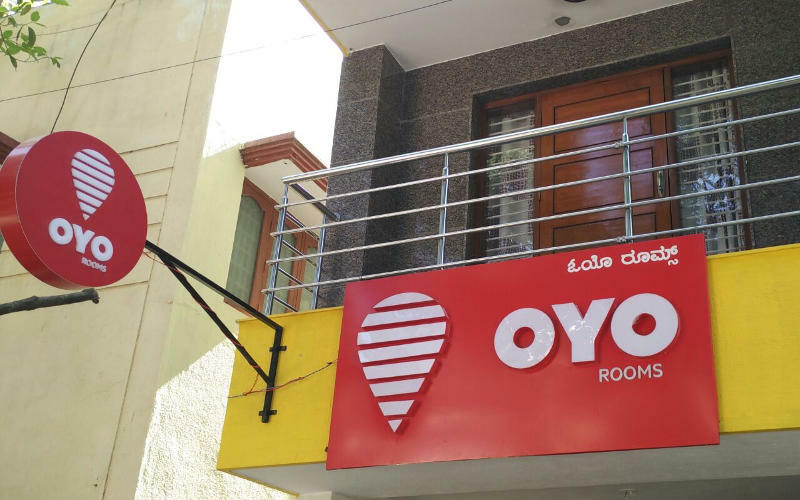 Editor's Note: Budget room aggregator Oyo Rooms is one of the most funded players in its space. Armed with funding from Sequoia Capital and Softbank, the startup was reportedly in talks to acquire its competitor Zo rooms. The story of Oyo Rooms almost reads like a fairy tale; helmed by 21-year-old Thiel fellow Ritesh Agarwal, an investigative feature that dug deep into its origins found plenty of cracks in the founder's narrative. Our perceptions of the startup were tempered by a number of unhappy accounts on blogs and many such personal experiences from Twitter users. Kunal Pandya, CEO of Gujarat-based NCrypted, which calls itself a startup enabler, says his company had licensed its vacation rental product Bistrostays to the founder when Oyo Rooms was called Oravel. Pandya recently called Agarwal out on Twitter for his alleged coding skills, as reported by a leading national newspaper. We encouraged Pandya to mail us his side of the story. The media is giving too much attention and hype to Ritesh Agarwal, founder of Oyo Rooms, and seems to be posting whatever he has to share. What's surprising is that Ritesh is trying to present himself as a 'coder' in front of the media - surprising because Oyo's parent company Oravel has been our NCrypted's client, and we knew Ritesh from before he was famous. The truth is that the early days of Oravel and Oyo were built on a foundation of lies and Ritesh seems to have faked almost everything that stands as his founding pillars, from his education to funding rounds. In the early days, I was a partner to Ritesh when he was new to the industry, and can personally comment on some of the myths behind the Oyo story. Let me tell you one thing straight away - the guy is an outright liar. He knows no coding and has faked almost every credential prior to his funding rounds. I am not in contact with him since Oyo's second round of VC funding with Sequoia in early 2015, and can't comment if he learned some kind of coding afterwards, but much of what had to happen happened already by then. His age has certainly played a factor behind much of this hype and people got curious as to how a 21 year old can build such a website and a business around it. This is the true story of how he got started, and how NCrypted played a major role in building his career. Ritesh contacted us in June 2012 to enquire about our vacation rental product BistroStays. Apart from the domain license, he required many customisations as well. This was before Oyo Rooms was launched, and Ritesh had just gotten started with Oravel, which had a couple of static pages and practically no traffic. At this time, the business did not have any VC or angel funding at all. Ritesh hadn't gone for the much hyped Peter Thiel fellowship yet, and he hadn't joined Venture Nursery yet. According to him, he 'tried' to attend college for a day, but the reality was he was just a 12th grader who knew some basics about websites and was very enthusiastic about the new dotcom boom in India. Our job was simple just like any other software vendor - irrespective of who you are and what you do, if you want to buy our products and services, then we would be happy to serve. Ritesh didn't know anything about coding; he just knew that he wanted to quickly create an Airbnb clone and get a couple of million dollars of funding. To do this, he needed our code - BistroStays lets you start your own vacation/ apartment rental website - without needing to know anything about coding. It is a bundled Web product and you don't require any programming knowledge to start and operate it. Unfortunately, we soon found out that Ritesh and his company Oravel Stays didn't have the money to pay us. For months, we went to him with bills but didn't get any payment after the first upfront payment was made to start the project. Ritesh desperately wanted to launch the site on the new product and kept on promising me personally that he would pay soon. Trust is a major factor in our industry, so we went ahead, deployed the product and activated the license file. Here is how the site looked in January 2012 before it was deployed on our product. And here is a screenshot of the site taken in December 2012 after the site started running on our product. BistroStays was powering the site till mid-2013, when we had to withdraw and cancel the license due to payment issues. The software allowed Ritesh to start listing sellers and buyers as they could sign up themselves. With the advanced admin panel back-end system, it was now possible for them to monitor and keep a track of what's happening with every single module that is in transition. The SEO-friendly front-end helped as they started seeing some organic traffic on the site on their Delhi NCR property listings. Since we refused to continue working unless all outstanding dues are settled, Ritesh offered around 1.5 to 2 percent equity in Oravel Stays to me along with half payment settlement as per the dues. He shared his bank balance screenshot which had less than Rs. 50,000, and I already started to feel cheated." If you don't have money, why request for such heavy customisations and force us on launching the site," I asked to myself. Eventually, we decided that he was just a 21-year-old in over his head, and didn't think that he would be intentionally cheating us. And so we chose to believe him, because I rather wanted to back him. We are a startup enabler and all our products are targeted for startups and small to medium scale businesses. Their success is our success. In July 2012, we worked out on a deal for stock and cash wherein Oravel Stays will issue about 420 fresh shared to us, plus cash, and we continue the relationship. The papers were not yet signed as Ritesh insisted that we do so next month, just before getting funded. Somewhere around in August, after the beta site was launched on our product, Ritesh told me that Venture Nursery has made the investment. This was a surprise to me, as Ritesh had still not signed our agreement, and now our money and our shares were at stake. Ritesh had said Venture Nursery would invest somewhere between Rs. 50 to Rs. 75 lakhs but he then shared a picture of the cheque from Venture Nursery of just Rs. 5 lakhs. This was less than the dues he already owed us, and I started losing trust. Apoorv Sharma, who was Executive VP of Venture Nursery at that time, called me to understand how the product works. Ritesh acknowledged this in an email exchange with Apoorv and me, writing that NCrypted has been a huge support in building Oravel's next high quality site and support. So, Ritesh got the beta site live running on our product, and showcased that to Venture Nursery. Venture Nursery now got interested and enrolled him into its accelerator program, with a promise of Rs. 5 lakh investment. With our product in the back-end, Oravel was shaping up fine. We were yet to get paid but kept working and trusting Ritesh. We had two options - either quit or keep working, and we thought that if we quit, we will never recover the money he owed us. So it seemed to be in the best of our own interest, at that time, to see to it that his website shapes up well and gets funded, so that we can get paid and have some real worth to our 'promised' equity. Our accounts team meanwhile kept sending invoices to Ritesh and he continued delaying. I personally asked Ritesh to send us postdated cheques as security, until we have the agreement signed. Many of his cheques had already bounced by this time. Ritesh slowly stopped updating me on funding rounds and his experience with VentureNursery; and our team, as per our commitment, continued working on his product. 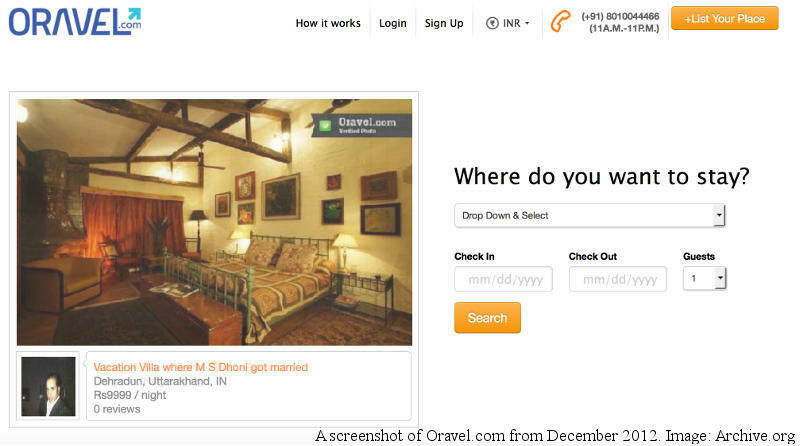 Somewhere around in February 2013, Ritesh hired developers to work on Oravel.com. They took their own sweet time to learn the system. Meanwhile Ritesh had our copyright notice removed from the site footer and this is how we got to know that he has started working with somebody else despite having all these promises of equity plus cash. It was time that we had to part ways. I asked him to discontinue using the product as we will withdraw the license because of overdue accounting for more than six months. At the time, Ritesh continued to insist on an equity partnership. In March 2013, Oravel finally discontinued using our product after a series of emailed requests. Ritesh refused to pay part of the remaining dues and argued that since Oravel was no longer using the product, it wouldn't pay for the product at all. Our legal team was planning to file a case but I didn't want to focus on this dead client, so I said that we will accept the remaining dues and preferred to focus on our own business. While this was happening, Ritesh got the Thiel scholarship of $100,000 (approximately Rs. 66 lakh), and a couple of rounds of angel and VC funding, but he kept us in the dark, instead of paying the money he owed quickly. I later learned that Venture Nursery and some other angel investor had put in Rs 30 lakh into Oravel after the initial Rs. 5 lakh, probably after the launch of the website running on our product. Ritesh never shared this with me, as otherwise he would have had to pay the dues and sign the stocks deal which he had promised. During all this, Venture Nursery kept investing in media and PR, and Ritesh was noticed by the world, pitched as a 21-year-old coder with an angel backed venture, seeking more VC funding as the business is now ready to expand. Except of course, none of this was really true. When Ritesh was still struggling with the new site development after we removed our product, luck came to his aide. Somewhere during March end 2013, Ritesh got the big news - he was selected as the first Indian to receive Thiel Fellowship. According to the Mint article, Ritesh wrote to his newly hired freelancers, "One thing is pretty urgent -Let's make the earlier code and database we had on the live site... Until then we can't afford to have the 20 under-20 guys take a note of we not having a real product... we can use the situation to our advantage in the manner of launching the day we have the final conference (13th)." This archive of Oravel.com taken on April 23, 2013 shows they were present in more than 60 cities in India and had properties in Singapore as well. Some of the city names are incorrect and the site is entirely static with no real back-end present. Any experienced coder should have recognised this, but that's not what happened. Instead, they bought the story and Ritesh got lucky yet again. He not only received a $100,000 scholarship from the Thiel Foundation, but got a big Silicon Valley name backing his company. In May, Venture Nursery arranged for a PR agency for press interviews on the Thiel fellowship. The rest of the story is published in Mint. Ritesh continued his saga of faking and screwing relationships once he got what he wanted from it after this as well. Chapter 5 - What comes next? Guys like Rahul Yadav, the ex-CEO and founder of Housing.com, and Ritesh Agarwal of Oyo Rooms, are ruining the Indian startup ecosystem. They are presenting themselves as India's Steve Jobs, projecting themselves as 'products guys' and if you read any media interviews of these guys, they constantly try to project themselves as big thinkers and innovators. But when you look at it, what innovation has Oyo Rooms actually done? This entire idea is running behind the logic of launching an Airbnb clone in India, and later pivoting to an Uber type of business model. Now, of course, you have to implement this in a new market and India brings its own set of hurdles, so hard work is accepted from that point of view. The problem rather is when these guys project themselves as so-called 'innovators'. And, hell, Ritesh went ahead and called all of his competition as imitators and copycats? Surprisingly, Softbank is a common large investor in both Housing and Oyo Rooms; both startups founded by big-mouthed 'visionaries'. But the Indian audience and Internet users at large are not stupid. They don't want startup heroes. They simply want a solid product to solve their real life problems. If these guys can do that well while not trying to burn easy VC money, they will have a better chance. But that doesn't seem to be happening as Oyo Rooms' business model requires them to burn cash heavily, not just on operations and human resources, but on partner hotel retainers as well. Hotels I've spoken to tell me that Oyo has to buy out a specific quota of rooms with partners on a monthly basis, whether or not they are able to re-sell them. That's why Oyo is able to offer hotels for Rs. 999 even though the hotel charges Rs. 2,000 if you go directly. Now you know where the $125 million funding is going. For now, it benefits the hotels and the travellers, but there are problems that will certainly occur down the road. HomeJoy.com, a US based Uber-for-X startup faced this tough question after three years of its inception and had to shut down. Oyo is moving in the same direction right now. Ritesh might have gotten lucky and was able to get funding rounds by selling fake numbers, but the end consumer is not stupid. They don't want to use Oyo just because it was built by a 21-year-old. They want to use it because they find something dirt cheap and too good to be true. The billion dollar question is - when the party ends and VC money dries up, how will Oyo be able to provide dirt cheap rates? Disclaimer: The opinions expressed within this article are the personal opinions of the author. Gadgets 360 is not responsible for the accuracy, completeness, suitability, or validity of any information on this article. All information is provided on an as-is basis. The information, facts or opinions appearing in the article do not reflect the views of Gadgets 360, and Gadgets 360 does not assume any responsibility or liability for the same.